A salute to those who have laboured through to this point (and to demonstrate that it is reproducable) Here are some pictures of other peoples machines. Photo 1 - Chris and his friend put together this unit; laser cutting the parts out of half inch acrylic. Not only does it look super it must weigh a ton. But kudos, anyone who's worked with acrylic knows laser cutting it is great but it is a very very unfriendly material to drill and there is a lot of side drilling in this design. Good job guys, check out more details (and photos including some testing with circuit boards) on Chris's blog rainbowlazer.com. I particularly like his work with making 3-d objects out of 2d cuts (here) . 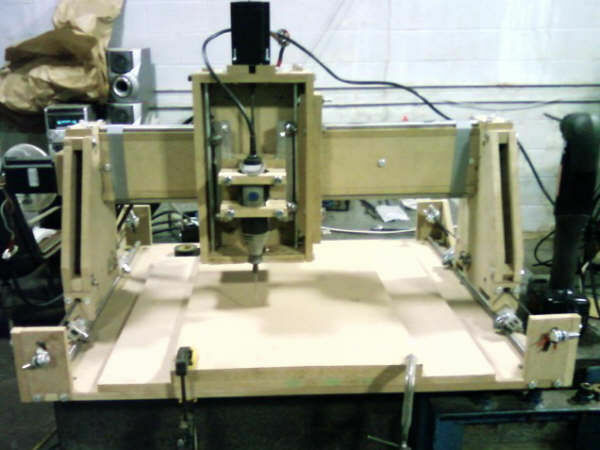 Photo 2 - Sam McCaskill has finished his desktop CNC machine and it's looking really really nice. Super impressively he also resisted the urge to cheat and cut all his pieces by hand. I'm really impressed. Photo 4 - Bret Golab's - Bret has completed his and gone through the extra step of getting it setup to work with Linux CNC (a task I attempted and was foiled by complexity). If you're interested in his settings you can send him a message (Instructable ID: bretlyssii ) ). Great job Bret! I'm afraid I don't have the space (or the expertise for that matter) to go into the fundamentals of CNC here but there is one websites in particular I found quite useful in my research. The goal was to try and keep the tools required within the realm of an average handyman's shop. -I attached a dremel type cutting tool to my machine however if you are more interested in additive construction (like fab@home or RepRap) you may wish to look into their deposition tools. -the metric components and especially the cross nuts aren't very popular and I had to visit several Home Depots in my area before I had enough. I had some experience Scroll Sawing pieces so I choose to use a glue on pattern method. What is required is to print out the PDF pattern files onto tiled pages, then glue on each pattern, and cutout each piece. 4. (IMPORTANT) in the page scaling dialog select "none"
2.For the aluminum tube the pattern must be glued to two sides. If the Tube is laying flat on a table and you glue the side A patterns to the top side B can be glued on either of the side faces. Not too much to say for this step simply cut around each outline. I have not counted but this project requires a lot of holes. The holes which are drilled into the edge of the material are particularly important so just take your time, you'll appreciate it later when you need to use the rubber mallet only sparingly. The areas with holes drilled overlapping are an attempt to create grooves if you have a table router that would work much better for this. If you've made it this far I must offer my congratulations and suggest it only gets better from here. Looking at the pile of pieces picturing how it manages to become a machine may be a tad abstract so I tried my best to create instructions as close to those produced by LEGO. (downloadable in the attached pdf CNC-Assembly-Instructions.pdf). But in the interest of amusing along the way here is a timelapse of me putting my machine together. Almost there. All that is required is to wire up your motors and controller following their instructions, and to set up your control software using the included instructions and the machine specific details included here in step 2. There you have it hopefully you are finished and ready to go into production. I hope I have not left out any crucial details but if you think of something you'd like to know which I have omitted please just ask. Finally to demonstrate that it all works a video of my machine cutting out a pattern in pink foam. A big thanks to the author, oomlout for this terrific instructable. I read this about one year ago, and purchased a kit from outland86 soon after. I now have a fully working CNC machine thanks to them! I want to provide a 3D model of this machine that I made in Google Sketchup for everyone to use to help learn more about how this machine fits together. I've checked with the author, and he's fine with me providing it to the community. I wish I had something like the model when I was first assembling the machine; it took a lot of trial-and-error to figure it all out. Hopefully this model will make the road easier for future CNC'ers. I made this model because I plan to expand the Y-axis to 36", so now I have a virtual copy of my machine to modify. Enjoy! I was also hoping for an updated link. Is there one? This is the original model, as designed by author. I have not shared my expanded design with anyone else. do you mind exporting this in a seperate format other than Sketchup??? Sorry, I can't do that. The Pro version of Google Sketchup is required to export to other formats, but I only use the free version. Anyone who has Sketchup Pro could do this very easily, any volunteers? "The Pro version of Google Sketchup is required to export to other formats..."
Not its not. You just got to add some things to it. Waddya want to export the file as? STL? DXF? OBJ?.X? Find the ruby script you want, download and install it. To the rest of you: now you've got an easy way to convert the sketchup model to whatever format your heart desires. Enjoy! Very cool, thanks for doing this! I started to build this over the summer. i had the parts laser cut at my college from the DXF file. i just completed it a week ago after modifying it for better precision on the X and Y axes. i replaced the belt dives with threaded rod so now i can step forward 0.001" no problem, i think i can even do 0.0005" fine. modifying the X and Y axes for threaded rod control isn't that bad, the only hard parts were making the new motor mounts and controlling both sides of the Y axis with one stepper. i ended up controlling both the Y axis threaded rods (one on each side) by mounting the timing belt pulleys on the ends of the threaded rod and running a timing belt around the rods on the back of the machine. the reason for all this is because i want to do very small precise machining. i already have milled a couple propeller molds, to lay carbon fiber over, that are 1" in diameter and need 6000 lines of G-code to mill. i actually have another being milled right now. they came over very nicely. I'm building one right now. The purpose of the machine is to mill PCB's i need the machine accurate to 0,001 . Did you try the machine with the standard building? How accurate it worked? Can you put images of the changes you have done? yes, i tried the machine with the standard planes. the Z axis is fine at 0.001" res, probably more. the X and Y belt driven axes were only good for about 0.002" res. note my micro stepping was at 1/4. i didn't want to increase micro stepping because that is more of a software way of increasing resolution, i want to increase resolution the hardware way so i know i'm really getting what i want. when i switched to threaded rods i did get a slower traverse speed on those axes but increased accuracy. i also needed a larger stepper for my Y axis because it was driving two threaded rods as opposed to one. a final note is that i used (2) screw in T-nuts to attach each threaded rod to the machine (and ball bearing at the ends for support and to reduce friction). the purpose of two T-nuts is so that they can both be attached to the machine but tightened against each other a little to help reduce backlash. this creates more friction on those axes but it greatly reduces backlash to near nothing. for this mod i just got a 205oz-in stepper from HobbyCNC, and a 77" timing belt (same type as the kind used here) from mastercarr. everything else: timing pulleys, 1/4" bearings, 8mm bearings etc.. i reused. i used the 8mm bearings to fashion some extra pulleys on the back side of the machine for the 77" timing belt. Wow, not sure I ever thought anyone would actually complete the build but your machine looks awesome (sorry grew up on ninja turtles). Would you maybe have a photo which includes the full machine I would love to add on another step to the Instructable showing other peoples versions. (could you send it to me in a private message along with any relevant info you'd like included about your machine (of course only if you'd like it to be there) Also very impressed with your conversion to threaded rod, there are a lot of applications where the toothed belt just isn't precise enough.